PM Netanyahu promises to continue removing infiltrators via 'legal and appropriate' channels. 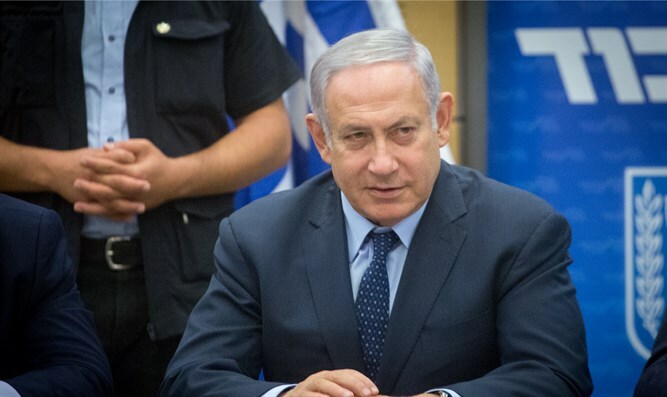 Israeli Prime Minister Binaymin Netanyahu on Tuesday evening spoke at a Likud conference in Tel Aviv, Israel Hayom reported. Speaking about the illegal African infiltrators, Netanyahu said, "The infiltrator problem is an extremely difficult and painful one. We need to ensure the welfare of those who are needy. It is inconceivable that a woman who lives on the fourth floor should not be able to leave her home because she's afraid, and there's filth and crime in the stairwell." Netanyahu added, "When they first came, no one did anything. I insisted on creating a physical barrier and the infiltration into Israel dropped to zero. However, until we built the barrier, 50,000 infiltrators entered Israel. We tried to fight their presence but it was a difficult task, and we ended up fighting over legal interpretations due to appeals from left-wing organizations." According to Israel Hayom, Netanyahu linked the Nationality Law to the infiltrator issue. "This is one of the reasons why I pushed the Nationality Law forward - it creates a balance for the claims that there are unlimited rights," he said. "You cannot claim that infiltrators have the same right to enter Israel as Jews. A Jewish and democratic state means that we ensure a Jewish majority." "We already removed nearly 20,000 infiltrators from Israel's borders, and we will continue to do so via legislation and appropriate and effective diplomatic channels." Israel's Nationality Law states that Israel is the Jewish people's nation state and establishes as law Israel's flag, symbols, the Hebrew language, and various other items mentioned in the Declaration of Independence. It does not, however, affect private individuals' personal rights.